It's Halloween in Los Santos, which means it's time to terrorize the neighborhood while reaping the benefits of a litany of bloodcurdling bonuses and deadly discounts. There's also 25% off all returning Halloween content - including the Fränken Stange, Lurcher and the demonic LCC Sanctus - as well as the Duke O'Death - now through November 6th. Escape the ghouls and costumed crazies in style; whether you're landing on a desert runway or splashing down right next to your private yacht, the Western Seabreeze is a business class option for every occasion and locale. And if you’re the kind of high-earner who might have need of a machine gun and bomb bay, don’t worry, there’s plenty of room. The Western Seabreeze is now available for purchase at Elitás Travel. For those who are a bit squeamish, there are plenty of other GTA Online bonuses to take advantage of through November 6th. 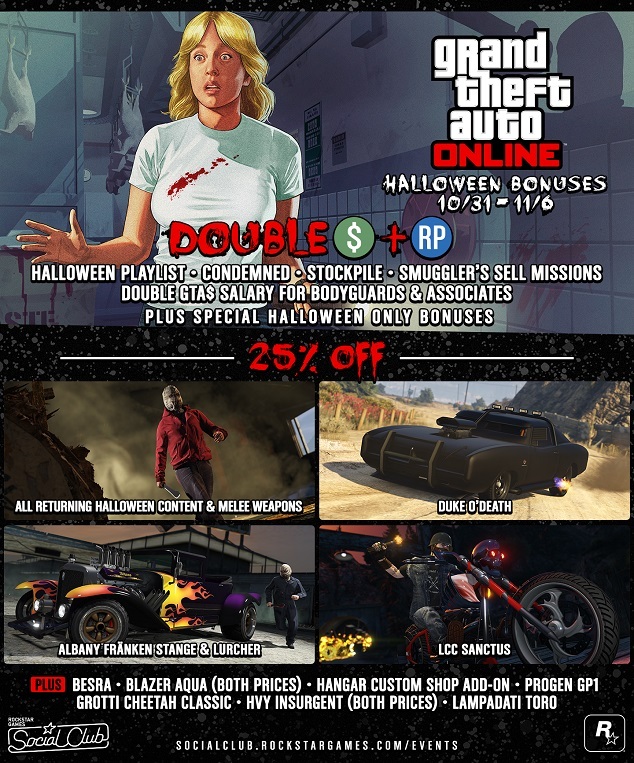 In addition to the continuation of Double GTA$ and RP on Smuggler's Sell Missions and Double GTA$ Salary for Bodyguards and Associates, join a different sort of mile high club and earn Double GTA$ and RP on the Stockpile Adversary Mode. As a reminder, simply log in through the 6th to claim a GTA$400,000 award, which will slip into your Maze Bank account by November 13th. Get lifted with this week's Premium Race & Time Trial events, now live through November 6th. • Time Trial - "Observatory"
Enjoy and chat it up in the GTA V forums!